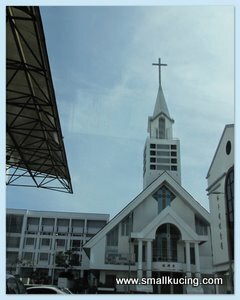 After the two breakfast, Papa drove us around the town while waiting to meet up with Uncle Arthur and Mommy Ling. Interesting. 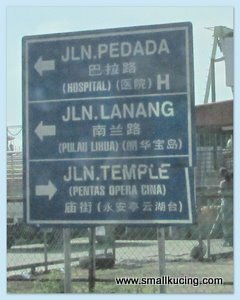 You can still find road sign with Chinese wording. On our last day there, Mamarazzi also saw an Ah Pek riding bicycle with bicycle licence hanging there. 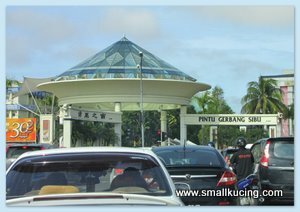 The Gateway of Sibu. Though the roads there might have traffic jam, but it's not as bad as KL. 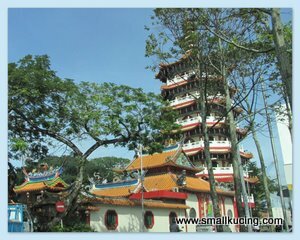 Seven storey Pagoda. We didn't go down to snap photo coz everyone were too full to walk. Interesting roof. It reminds Mamarazzi of the roof of Masjid Negara. We stopped by Lin's Swan Garden to snap some photos. 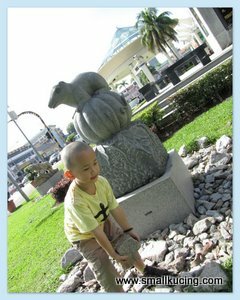 Mamarazzi asked me to stand next to the mouse...I pulak like jakun kept wanna play with the rocks there. Refused to look at Mamarazzi. 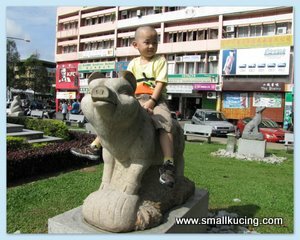 In the end, plonk me on top of the piggy and snap photo only lah although my Zodiac is not piggy. Mamarazzi saw in the map provided by Uncle Arthur there is something called THE ARK. She thought it was a ship or a boat. 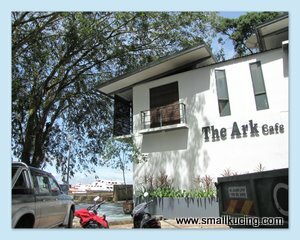 Turna and turn and finally found THE ARK CAFE laaaaa......Nevertheless, the place looks very classy. 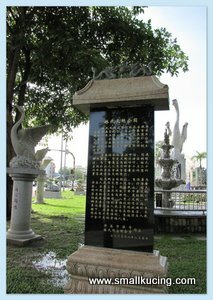 "Swan of Sibu : The graceful Swan on the Rajang Riverside Esplanade is an ancient Chinese symbol of good fortune and health, an auspicious omen for a community living in harmony, peace and goodwill.A Swan is said to have been fed by the town folk of Sibu, long ago, eventhough they themselves were starving. The grateful bird showed them how to extract edible starch from wild sago to end the famine - one good turns deserves another!" View is good from here. I wanna "draw" the view la. Found this playground next to The Ark Cafe. Played awhile and Uncle Arthur messaged. Time to makan(eat). He led us to our next makan destination. You did not go to The Ark! Very nice food there too! 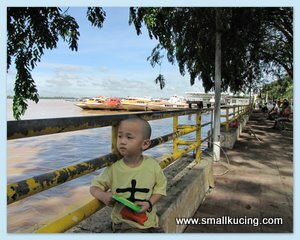 Nice trip to Sibu...wen coming to Sibu again? 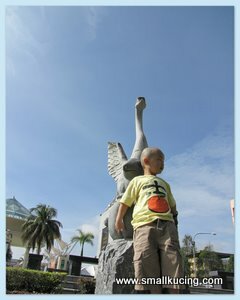 or plan to go Medan for holiday?I am back to Medan this coming Nov.
ya..it's a safe place..btw, I like that swan! He hearts the toy drawing board very much. He brings it everywhere he goes. 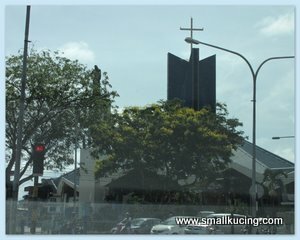 There's one small wooden one - the old Sibu mosque - I do hope they do not get rid of it though...one of the few things that's left of old Sibu - heritage! We did not pass by the new(er) and bigger one - not in the town centre or its vicinity. i love the picture of refusing to look at the camera :P the scenery is good there! Think saw one..but cant recall where .. 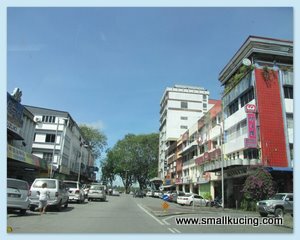 Thanks for sharing, I been to Sibu once, evening sampai dan Balik next day afternoon, tengok nothing, hahaha .. I still remember going to some of the places as seen in your post and it was a wonderful experience.